Modica’s special urban design, with its intricate network of stairs and narrow alleys that snake up the four surrounding hills, explains its designation as “the most unique city outside Venice” and UNESCO World Heritage Site. There are so many ways to explore Sicily. This time we chose to highlight the southwestern side of the Island and its baroque treasures. Baroque Sicily has a particular charm, one that epitomizes Mediterranean aesthetics. As you turn from scanning the Tyrrhenian to the peaks of Mount Peloritani flitting by, the airplane begins its descent into Catania. In a few minutes the commanding profile of Etna appears, a feathery white cloud hovering on top. Or maybe it’s smoke. We should respect the volcano; despite the headaches its eruptions can cause, it is still part of our heritage. Viewed from above, Etna really is a wonder, with its lava blackened summit and lush green base at the start of summer. The surrounding volcanic earth yields savory red and white wines with earthy flavors. Like a gendarme, Etna watches over the splendid city of Catania, which merits a visit, but we’ll have to save that for another day. 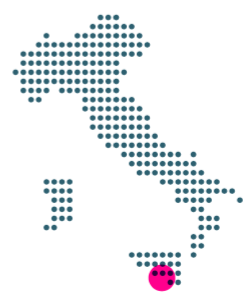 This time we’re headed to the southwest of Sicily. Our friends from Modica are waiting for us in the airport. All it takes is a quick meal in a little restaurant on the outskirts of town for Sicily to welcome us with a waft of flavors: pasta with sardines and a fennel aroma washed down with an excellent white wine from Etna, grilled swordfish, and for dessert a slice of Sicilian cassata and good coffee. Next we hit the highway in the direction of Syracuse. The bright sun casts a golden light over the citrus fields and vegetable plots in this lush, fertile soil. The vibrantly lit oleanders in bloom flank the black top until to our left there appears a skyline of chemical plants that signal we’ve reached Augusta. The port city sits on the northern end of the bay, and in the center of the gulf shine the ancient remains of Megara Iblea. Founded in the eighth century BC by Greek colonists from Attica, there are still vestiges of the city wall, agorà, temple to Aphrodite and thermal baths. You can also visit an “antiquarium” to see the ruins and grave goods of the colony’s necropolis. On the southernmost point of the gulf stand the remains of Thapsos, which dates back to the Bronze Age. Fifteen minutes down the road there emerges on the horizon a peak, almost a pyramid. That’s the sanctuary of the Madonna delle Lacrime, a radically designed circular temple, at the entrance of Syracuse. We can’t stop long because our destination is the old city on the island of Ortygia. Syracuse shoulders a millennial-old history. It was founded back in 734 BC by Greek settlers from Corinth. One of the major Hellenistic cities, in terms of power and wealth, Syracuse was a competitor of Athens, which tried in vain to subjugate the city, and the main rival of the Phoenician city Carthage. Only Rome succeeded in conquering it, in 212 BC, and not without difficulty. A hub of artists, philosophers and scientists, Syracuse was the birthplace of Archimedes and a destination for illustrious figures, like Plato, who visited three times, Aeschylus, Pindar and Xenophone. Cicero later lauded it as the most beautiful Greek city. In successive centuries, it became an intersection of peoples and conquerors: Angevins, Arabs, Aragonese, Byzantines, Normans and Swedes. This melting pot phenomenon led to Sicily’s extraordinary hybrid of civilizations. Our first stop is to admire the ancient Doric temple of Apollo at the entrance of Ortygia. Throngs of tourists enliven the maze of narrow streets running through the island, granting it the kind of grandeur that only cities with a long history can summon. We follow the crowds streaming by, browsing for glass souvenirs, until to our right we spot a wide paved road leading to the heart of the city and a broad rectangular piazza. There we glimpse the magnificent Cathedral built over the ruins of a Doric temple of Athena, the Municipal Palace, the Episcopal Palace, the Church of Santa Lucia alla Badia, and other elaborately designed palazzos. The Cathedral combines a number of styles: its facade ranges from the baroque to rococo periods, and its interiors has everything from Greek ruins to Norman built medieval sections. 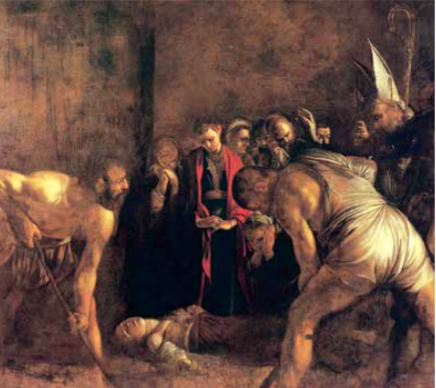 But we’re headed straight for the Church of Saint Lucy – she was born here and is the city’s patron saint – to admire Caravaggio’s large canvas, the Burial of St. Lucy, a masterpiece by the great artist of light. This splendid city harbors many other jewels for tourists, but our time is running out. We hop back on the road and in no time reach Avola. It lies on our left, near the sea. The city is renowned for its almonds and, especially, “Nero d’Avola,” a full-bodied red wine with hints of cherries and prunes, best grown in the coastal stretch between Avola and Pachino. We speed off in the direction of Noto. 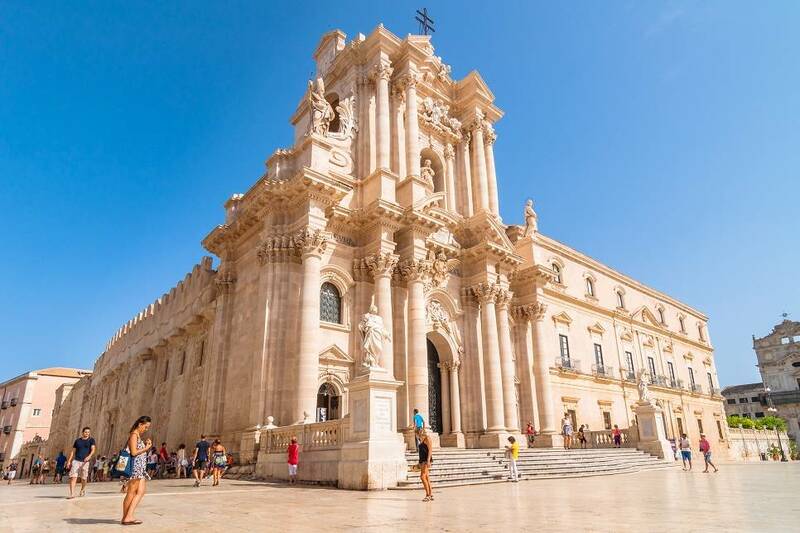 We would be remiss not to make a pit stop in the baroque capital of Sicily. 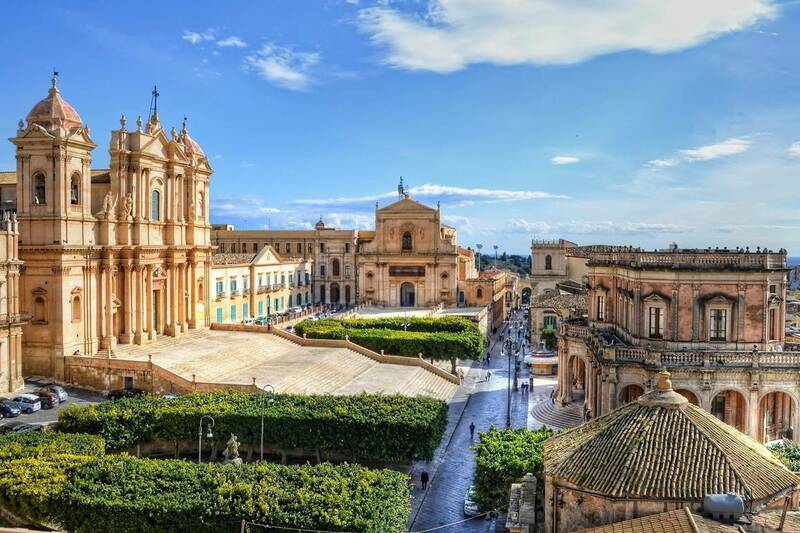 Noto was entirely rebuilt on a new site after the devastating earthquake of 1673. We enter through the Porta Reale onto Corso Vittorio Emanuele. The Church of Santa Chiara, magnificent palazzos, monumental staircases, Palazzo Ducezio, Cathedral, and the Churches of San Carlo and San Domenico rise up in all their beauty, lit by the setting sun. The city, a world heritage site, is a real gem. Its beauty is intoxicating. We have just enough time for a refreshing granita and cannoli—the out-of-this-world and not-to-be-skipped sweet here. There’s a pleasant sense of anticipation en route to Modica, especially when the highway ends abruptly in Rosolini and merges with a minor arterial road. No problem. Actually, it allows us to get a better glimpse of the landscape in this part of Sicily, as we cross the Hyblaean Mountains, an expansive rocky tableland. The fields show off the variety of the island’s agronomy: vineyards, orchards, olive groves and leafy carob trees fleck the earth that alternates green vegetable patches with golden wheat ready for harvesting. The series of fields are fenced off by orderly stonewalls, made with stones that have been gathered from the earth and carefully assembled by generations of farmers, as their colors attest. The stunning panoramic stonewalls form a dense labyrinth of property lines, a harmonious mix of working farmland where cows, sheep and goats graze. The air is clean. The clear sky is an intense blue. Near Ispica, the limestone has been deeply scored by coursing water for millennia. Dense brush gives it a wild look. The deep grooves in the rock are called “cave.” The cliff walls often face grottoes. Prehistoric people emerged from these caverns, as was revealed by the necropolises in Pantalica and Cava d’Ispica, which date back 2200 years before Christ. Important ruins and rock paintings have been discovered here, while a third century bronze statue of Hercules, now housed in the civic museum, was found on the outskirts of Modica. Speaking of Modica, we’ve almost arrived. After a series of windy curves, the profile of the “città alta” emerges, dominated by the Church of Saint John above and a little farther down by the majestic facade of the Cathedral of Saint George. The city is really something, jutting from either side of two canyons that were hollowed out over millennia by a pair of streams that merged below, in today’s “città bassa.” Modica’s special urban design explains its designation as “the most unique city outside Venice” for its intricate network of stairs and narrow alleys that snake up the four surrounding hills. The urban design is utterly affecting, quilted as it is by a hundred or so late baroque churches, noble family palazzos, monasteries, and various convents, which have impacted the cultural life of the city for centuries. 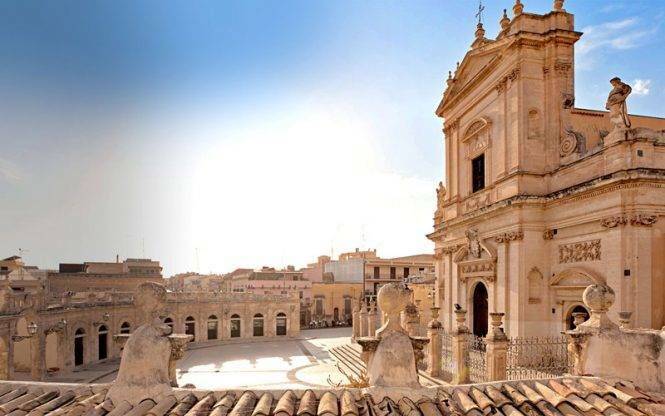 Modica has been recognized by UNESCO for its architectural value. 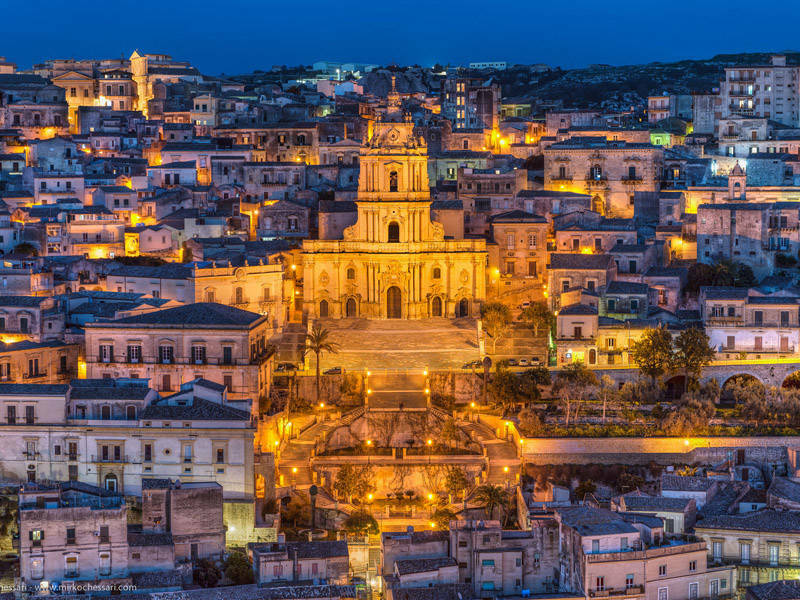 Founded in 1360 BC, the city experienced a golden age around 1296, when King Frederick II of Aragon appointed Manfredi Chiaramonte Count of Modica. For centuries the County of Modica was the largest, richest and most powerful feudal state on the island. In Sicily, the figure of the Count of Modica also happened to be the King’s Viceroy. And the Chiaramonte family enjoyed uncontested prestige, partly because the family descended from Charlemagne. But on January 11, 1693, tragedy struck. The entire county was hit by a devastating earthquake that reverberated over a wide swath of southwestern Sicily, as far north as Catania, destroying cities and castles. 100,000 died. Yet the area was quickly rebuilt and the cities emerged more beautiful than before. In fact, the greatest Sicilian architects – Rosario Gagliardi, Paolo Labisi, Vincenzo Sinatra and others – were operating at that time. These sophisticated artists and expert artisans breathed new life into Sicilian baroque. 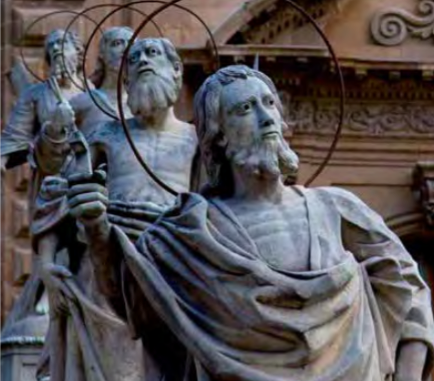 Their best works have been recognized by UNESCO, as have the cities of Caltagirone, Catania, Militello, Modica, Noto, Palazzolo Acreide, Ragusa and Scicli. 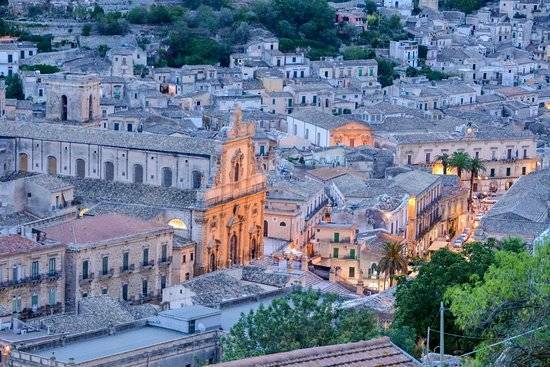 A stupendous example of baroque Sicily, Modica is now a beautiful city with 55,000 inhabitants. Nobel laureate Salvatore Quasimodo was born here in 1901, and it is the city of chocolate. Beloved the world over, Modica chocolate is specially prepared. There are many manufacturers, but there is one in particular worth singling out: Casa don Puglisi. The manufacturer uses proceeds from its chocolate and candy production to help support its namesake shelter and community center. 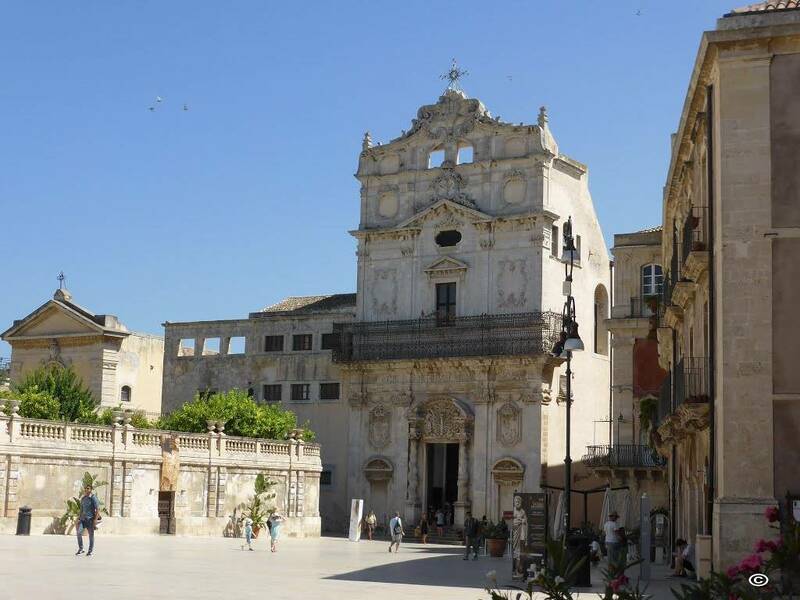 Our tour ends in Scicli, another pearl studding this corner of Sicily, all the more precious for its magnificent churches and superb baroque buildings, including Palazzo Beneventano and Palazzo Civico. The latter is well known as Inspector Montalbano’s police station in RAI’s film adaptations of the famous novels by Andrea Camilleri.